For starters, we had Cheddar Cheese Fries (Php 225 for regular, Php 325 for large) and Caesar Salad (Php 325 for regular, Php 425 for large). The salad was satisfactory for me and my mom, but the cheddar cheese fries needed more cheese sauce, in my opinion. For main course, our family shared the Shrimps and Ribs Platter (Php 995, large). The platter has barbequed baby back ribs, Cajun-spiced fried prawns, served with fries and grilled corn. Claimed as their bestseller, I wasn't amazed with this dish. The fried prawns were too greasy, and the ribs wasn't to our liking. 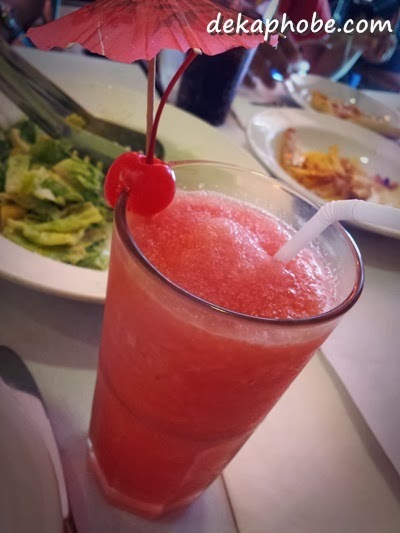 My only consolation was the Watermelon Shake (Php 145), my favorite fruit smoothie. Overall, Burgoo is a kid-friendly restaurant efficient when it comes to service. However, given the bill that we paid (around Php 2500), our family would rather go somewhere else with better and more delicious food. Should Burgoo improve on their food, I'd gladly give them another visit. I went there last week and I liked the lemon grilled chicken with rice and veggies but for 395 pesos? Too pricey in my opinion. The chicken tasted good but it wasn't spectacular in my opinion. I've been to Burgoo a few times, and I'm not really impressed with their food either. For me, I feel like most of their dishes are under-seasoned. Dunno if they made it this way on purpose since they're serving American food? BUT, I really love their Fudge Brownie ala Mode. It has one of the best brownies I've ever had! :) Hopefully they're still serving good rendition of this.